The Fall Would Break His Body, But Not His Spirit. 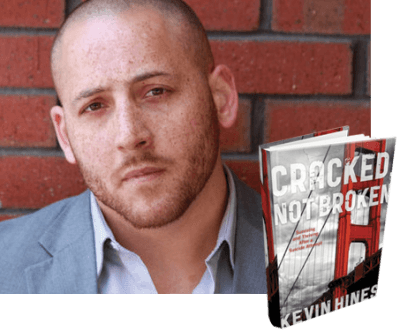 Kevin Hines is a brain/mental health advocate, award-winning global speaker, bestselling author and documentary filmmaker who reaches audiences with his story of an unlikely survival and his strong will to live. Two years after he was diagnosed with bipolar disorder (19 years of age), he attempted to take his life by jumping from the Golden Gate Bridge. He is one of only thirty-four to survive the fall, and the only one to regain full physical mobility. He is the only Golden Gate Bridge jump survivor who is actively spreading the message of living mentally healthy. The fall would break his body, but not his spirit. Today, Kevin dedicates his life to saving lives by spreading the message of hope and sharing his art of living mentally well. He is one of the most respected and admired voices of lived experience. Kevin’s story is a remarkable testament to the strength of the human spirit and a reminder for us to love the life we have. Registered guests of The Executive Luncheon are invited to join us for a screening of Kevin Hines Suicide: The Ripple Effect documentary on Monday, May 20 at 7:30pm or Tuesday, May 21 at 11:00am. Thank you to The Lot La Jolla for generously hosting the screenings. The Behavioral Health Committee at Jewish Family Service of San Diego seeks to eliminate the stigma of mental illness through education and outreach. The Committee holds two community events per year to promote awareness on subjects related to behavioral health. Marcia Foster Hazan Cecile Jordan Ed.D.